A recitation of the potential consequences begs the question “Why are the penalties for violating VTL§ 1174 so severe?” The answer is simple: “Because children’s lives are at stake.” Children have been hit and seriously injured, or worse, by drivers who fail to stop for school buses. For example, a student was struck by a hit and run driver who illegally passed the student’s school bus. The child sustained serious injuries and spent months recovering from his injuries. On another day, a car illegally passed a school bus drove close enough to the bus to rip off the extended stop sign. These experiences were lamented in an Open Letter to Drivers that went out to parents in Bay Shore, New York at the beginning of the 2016 school year. In general, courts are getting tougher on VTL § 1174. In fact, some New York State Courts, including those in Westchester County, have a no plea bargain policy for this violation. 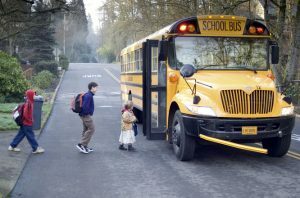 As stated in in the Open Letter to Drivers, due to serious nature of the violation and the real potential for loss of life, there is current movement urging “legislators to increase the penalties for passing stopped school buses” and “permit cameras to be placed on buses.” Allowing cameras to be placed on school buses to capture footage of motorist passing a stopped school bus can translate to less “Not Guilty” verdicts at VTL § 1174 trials. Have you received a ticket for Passing A Stopped School Bus in New York? Give us a call at (917) 300-3334 or 1-877-631-3539! We would love to chat with you and tell you exactly how we can help.